For other uses, see Beehive (disambiguation). A beehive is an enclosed, man-made structure in which some honey bee species of the subgenus Apis live and raise their young. Though the word beehive is commonly used to describe the nest of any bee colony, scientific and professional literature distinguishes nest from hive. Nest is used to discuss colonies which house themselves in natural or artificial cavities or are hanging and exposed. Hive is used to describe an artificial, man-made structure to house a honey bee nest. Several species of Apis live in colonies, but for honey production the western honey bee (Apis mellifera) and the eastern honey bee (Apis cerana) are the main species kept in hives. The nest's internal structure is a densely packed group of hexagonal prismatic cells made of beeswax, called a honeycomb. The bees use the cells to store food (honey and pollen) and to house the brood (eggs, larvae, and pupae). Beehives serve several purposes: production of honey, pollination of nearby crops, housing supply bees for apitherapy treatment, and to try to mitigate the effects of colony collapse disorder. In America, hives are commonly transported so that bees can pollinate crops in other areas. A number of patents have been issued for beehive designs. Honey bees use caves, rock cavities and hollow trees as natural nesting sites. In warmer climates they may occasionally build exposed hanging nests. Members of other subgenera have exposed aerial combs. The nest is composed of multiple honeycombs, parallel to each other, with a relatively uniform bee space. It usually has a single entrance. Western honey bees prefer nest cavities approximately 45 litres in volume and avoid those smaller than 10 or larger than 100 litres. Western honey bees show several nest-site preferences: the height above ground is usually between 1 metre (3.3 ft) and 5 metres (16 ft), entrance positions tend to face downward, Equatorial-facing entrances are favored, and nest sites over 300 metres (980 ft) from the parent colony are preferred. Bees usually occupy nests for several years. The bees often smooth the bark surrounding the nest entrance, and coat the cavity walls with a thin layer of hardened plant resin called propolis. Honeycombs are attached to the walls along the cavity tops and sides, but small passageways are left along the comb edges. The basic nest architecture for all honeybees is similar: honey is stored in the upper part of the comb; beneath it are rows of pollen-storage cells, worker-brood cells, and drone-brood cells, in that order. The peanut-shaped queen cells are normally built at the lower edge of the comb. Bees were kept in man-made hives in Egypt in antiquity. The walls of the Egyptian sun temple of Nyuserre Ini from the 5th Dynasty, dated earlier than 2422 BC, depict workers blowing smoke into hives as they remove honeycombs. Inscriptions detailing the production of honey are found on the tomb of Pabasa from the 26th Dynasty (c. 650 BC), and describe honey stored in jars, and cylindrical hives. The archaeologist Amihai Mazar cites 30 intact hives that were discovered in the ruins of the city of Rehov (2,000 residents in 900 BC, Israelites and Canaanites). This is evidence that an advanced honey industry existed in Palestine, approximately 4,000 years ago. The beehives, made of straw and unbaked clay, were found in orderly rows, with a total of 150 hives, many broken. Ezra Marcus from the University of Haifa said the discovery provided a glimpse of ancient beekeeping seen in texts and ancient art from the Near East. An altar decorated with fertility figurines was found alongside the hives and may indicate religious practices associated with beekeeping. While beekeeping predates these ruins, this is the oldest apiary yet discovered. Traditional beehives simply provided an enclosure for the bee colony. Because no internal structures were provided for the bees, the bees created their own honeycomb within the hives. The comb is often cross-attached and cannot be moved without destroying it. This is sometimes called a fixed-frame hive to differentiate it from the modern movable-frame hives. Harvest generally destroyed the hives, though there were some adaptations using extra top baskets which could be removed when the bees filled them with honey. These were gradually supplanted with box hives of varying dimensions, with or without frames, and finally replaced by newer modern equipment. Honey from traditional hives was typically extracted by pressing – crushing the wax honeycomb to squeeze out the honey. Due to this harvesting, traditional beehives typically provided more beeswax, but far less honey, than a modern hive. Four styles of traditional beehives include; mud hives, clay/tile hives, skeps and bee gums. Mud hives are still used in Egypt and Siberia. These are long cylinders made from a mixture of unbaked mud, straw, and dung. Clay tiles were the customary homes of kept bees in the eastern end of the Mediterranean. Long cylinders of baked clay were used in ancient Egypt, the Middle East and to some extent in Greece, Italy and Malta. They sometimes were used singly, but more often stacked in rows to provide some shade, at least for those not on top. Keepers would smoke one end to drive the bees to the other end while they harvested honey. Later skep designs included a smaller woven basket (cap) on top over a small hole in the main skep. This cap acted as a crude super, allowing the harvesting of some honey with less destruction of brood and bees. In England such an extension piece consisting of a ring of about 4 or 5 coils of straw placed below a straw beehive to give extra room for brood rearing was called an eke, imp or nadir. An eke was used to give just a bit of extra room, or to "eke" some more space, a nadir is a larger extension used when a full story was needed beneath. 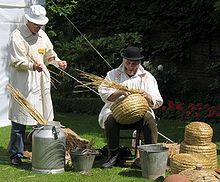 A person who made such woven beehives was called a "skepper", a surname that still exists in western countries. In England the thickness of the coil of straw was controlled using a ring of leather or piece of cows horn called a "girth" and the coils of straw could be sewn together using strips of briar. Likenesses of skeps can be found in paintings, carvings and old manuscripts. The skep is often used on signs as an indication of industry ("the busy bee"). In the late 18th century, more complex skeps appeared with wooden tops with holes in them over which glass jars were placed. The comb was built in the glass jars, making the designs commercially attractive. In the eastern United States, especially in the southeast, sections of hollow trees were used until the 20th century. These were called "gums" because they often were from black gum (Nyssa sylvatica) trees. Sections of the hollow trees were set upright in "bee yards" or apiaries. Sometimes sticks or crossed sticks were placed under a board cover to give an attachment for the honeycomb. As with skeps, harvest of honey from these destroyed the colony. Often the harvester would kill the bees before even opening their nest. This was done by inserting a metal container of burning sulfur into the gum. Bee gums are still used by beekeepers today, for bee species whose honey output is less than that of the more productive honeybee. Unlike most beehives (which are optimized for Apis mellifera and Apis cerana), the bee gum allows housing of other bee species. The bee gum allows the bees themselves to organize their nest. In some instances, bee gums are also still used, even with bee species that do not produce large quantities of honey (i.e. Apis mellifera mellifera). However, in these instances, part of the reason why bee gums are then used is that this allows the producers of the honey to distinguish themselves from other honey producers and to ask a higher price for the honey. An example where bee gums are still used is Mont-Lozère, France, although in Europe they are referred to as Log Hives. The length of these log Hives used are shorter than bee gums, they are hollowed out artificially and cut to a specific size. The earliest recognizably modern designs of beehives arose in the 19th century, though they were perfected from intermediate stages of progress made in the 18th century. Intermediate stages in hive design were recorded for example by Thomas Wildman in 1768/1770, who described advances over the destructive old skep-based beekeeping so that the bees no longer had to be killed to harvest the honey. Wildman, for example, fixed a parallel array of wooden bars across the top of a straw hive or skep (with a separate straw top to be fixed on later) "so that there are in all seven bars of deal" [in a 10-inch-diameter (250 mm) hive] "to which the bees fix their combs". He also described using such hives in a multi-story configuration, foreshadowing the modern use of supers: he described adding (at the proper time) successive straw hives below, and eventually removing the ones above when free of brood and filled with honey, so that the bees could be separately preserved at the harvest for a following season. Wildman also described a further development, using hives with "sliding frames" for the bees to build their comb, foreshadowing more modern uses of movable-comb hives. Wildman acknowledged the advances in knowledge of bees previously made by Swammerdam, Maraldi, and de Reaumur – he included a lengthy translation of Reaumur's account of the natural history of bees – and he also described the initiatives of others in designing hives for the preservation of bee-life when taking the harvest, citing in particular reports from Brittany dating from the 1750s, due to Comte de la Bourdonnaye. In 1814 Petro Prokopovych, the founder of commercial beekeeping in Ukraine, invented one of the first beehive frames which allowed an easier honey harvest. The correct distance between combs for easy operations in beehives was described in 1845 by Jan Dzierżon as 1½ inches from the center of one top bar to the center of the next one. In 1848, Dzierżon introduced grooves into the hive's side walls replacing the strips of wood for moving top bars. The grooves were 8 mm × 8 mm (0.31 in × 0.31 in), the spacing later termed bee space. 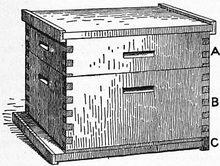 The Langstroth hive was the first successful top-opened hive with movable frames. The Langstroth hive was however a direct descendant of Dzierżon's hive designs. Most hives have been optimized for Apis mellifera and Apis cerana. Some other hives have been designed and optimized for some meliponines such as Melipona beecheii. Examples of such hives are the Nogueira-Neto hive and the UTOB hive. Boxes containing frames for brood and honey: the lowest box for the queen to lay eggs, and boxes above where honey is stored. Inner cover and top cap providing weather protection. Named for their inventor, Rev. Lorenzo Langstroth, Langstroth hives are probably the most commonly used. Langstroth patented his design in the United-States on October 5, 1852 originally for comb honey production but it has become the standard style hive for many of the world's beekeepers, both professional and amateurs. A common feature of Langstroth hives is the use of specific bee spaces between frames and other parts so that bees are not likely to glue together nor fill these spaces with burr comb: comb joining adjacent frames. The sizes of hive bodies (rectangular boxes without tops or bottoms placed one on top of another) and internal frames are relatively well defined for a particular style. Langstroth hive bodies are rectangular in shape and can be made from a variety of materials that can be stacked to expand the usable space for the bees. Inside the boxes, frames are hung parallel to each other. Langstroth frames are thin rectangular structures made of wood or plastic and typically have a wax or plastic foundation on which the bees draw out the comb. The frames hold the beeswax honeycomb formed by the bees. Eight or ten frames side by side (depending on the size of the box) will fill the hive body and leave the right amount of bee space between each frame and between the end frames and the hive body. Langstroth frames can be reinforced with wire, making it possible to spin the honey out of the comb in a centrifuge. As a result, the empty frames and comb can be returned to the beehive for re-filling by the bees. Creating honeycomb involves a significant energy investment, conservatively estimated at 6.25 kilograms of honey needed to create 1 kilogram of comb in temperate climates. Reusing comb can thus increase the productivity of a beekeeping enterprise. BS National hive: This smaller version of the Langstroth class of hive is designed for the less prolific and more docile Buckfastleigh bee strain and for standard dimension parts. It is based on square boxes (460 mm side), with a 225 mm standard/brood box, and shallow 150 mm Supers typically used for honey. The construction of the boxes is relatively complicated (eight pieces), but strong, and with easy-to-hold handles. The boxes take frames of 432 mm length, with a relatively long lug (38 mm) and a comb width of 355 mm. BS Commercial hive: A variation with the same cross-sectional dimensions as a BS National hive (460 mm x 460 mm), but deeper brood box (267 mm/10.5") and supers intended for more prolific bees. The internal structure of the boxes is also simpler, resulting in wider frames (406 mm/16") with shorter handles or lugs. Some find these supers too heavy when full of honey and therefore use National supers on top of a Commercial brood box. Rose Hive: A hive and method of management developed by Tim Rowe, it is a variation on the BS National hive. The Rose hive maintains the same cross-sectional dimensions of the National hive (460 mm x 460 mm), but opts for a single depth box of 190 mm (7.5"). The single box and frame size is used for both brood and honey supers. Standardizing on one size reduces complexity and allows for movement of brood or honey frames to any other position in the hive. A queen excluder is avoided, allowing the queen freedom to move where she wants. Boxes are added to the hive above the brood and below the supers. The colony can expand during large sap flow and retract to lower portions of the hive as the colony shrinks in the fall. When collecting honey, brood and honey frames can be relocated up or down the hive, as needed. Flow Hive: A proprietary design for a beehive launched in 2015 on Indiegogo. It was based on a design by father and son team of beekeepers and inventors, Stuart and Cedar Anderson from Australia to find a way of extracting honey from comb without the need to open the hive. The system uses food-grade plastic frames which can be split using a special tool and the honey then flows into containers without the need to remove any frames. However, the flow hive has been highly controversial within the beekeeping community as it encourages the lax of maintenance of the hives against diseases and pests and encourages sickly bees. The Warré hive was invented by the abbot Émile Warré, and is also called "ruche populaire" (fr) or "The People's Hive" (en). It is a modular and storied design similar to a Langstroth hive. The hive body is made of boxes stacked vertically; however, it uses top bars for comb support instead of full frames similar to a Top-Bar Hive, as a general rule. The popularity of this hive is growing among 'sustainable-practice' beekeepers. The Warre hive differs from other stacked hive systems in one fundamental aspect: when the bees need more space as the colony expands, the new box is "nadired". i.e. positioned underneath the existing box(es). This serves the purpose of warmth retention within the brood nest of the hive, considered vital to colony health. The WBC, invented by and named after William Broughton Carr in 1890, is a double-walled hive with an external housing that splays out towards the bottom of each frame covering a standard box shape hive inside. The WBC is in many respects the 'classic' hive as represented in pictures and paintings, but despite the extra level of insulation for the bees offered by its double-walled design, many beekeepers avoid it, owing to the inconvenience of having to remove the external layer before the hive can be examined. In 1890, Charles Nash Abbott (1830–1894), advisor to Ireland’s Department of Agriculture and Technical Instruction, design of a new Congested Districts Board (CDB) hive in Dublin, Ireland. It was commissioned by the Irish Congested District Board which provide support for rural populations until its absorption in the department of Agriculture. The Perone or Automatic Hive was designed by Oscar Perone, and aims at managing bees in a way more closely analogous to their natural behavior. It is favored by proponents of 'Natural Beekeeping', who seek to allow more natural bee behavior and minimize intervention into the hive. Perone Hives are very large 2 meter-high vertical top bar hives that remain the same size all year, split into a bee area underneath, and a bee keepers area above (Mark 1) or side by side (Mark 2). The total hive volume is large, around 280 liters, which it is proposed allows the bees to develop into a 'super-colony' differing in behavior to colonies in smaller hives. They are managed so that under normal circumstances the bee area is never opened, and the bee keepers area is opened only once per year when any honey is harvested. One of the most famous Slovenian beekeepers was Anton Žnideršič (1874-1947). It is he who developed the AZ hive house and hive box that is so widely used today in Slovenia. The top-bar or Kenya-hives were developed as a lower-cost alternative to the standard Langstroth hives and equipment. They are becoming very popular in the US due to their alignment with the organic, treatment-free philosophies of many new beekeeping devotees in the United States. They are also popular, owing to their simplicity and low cost, in developing countries. Top-bar hives have movable comb and make use of the concept of bee space. The top-bar hive is so named because the bees draw their comb from a top bar suspended across the top of a cavity and not inside a full rectangular frame with sides and a bottom bar. The beekeeper does not provide foundation wax (or provides only a small starter piece of foundation) for the bees to build from. The bees build the comb so it hangs down from the top bar. This is in keeping with the way bees build wax in a natural cavity. The hive body of a common style of top-bar hive is often shaped as an inverted trapezoid. Unlike the Langstroth design, this style of top-bar hive is expanded horizontally, not vertically. The top-bar design is a single, much longer box, with the bars hanging in parallel. This common style is sometimes referred to as a horizontal Top Bar hive, or hTBH. Because top bars are used as opposed to frames, the honey is usually extracted by crushing and straining rather than centrifuging. Because the bees have to rebuild their comb after honey is harvested, a top-bar hive yields a beeswax harvest in addition to honey. The bees store most of their honey separately from the areas where they are raising the brood. For this reason, bees are not killed when harvesting from a top-bar hive. Dartington Long Deep (DLD) hive: It takes 14 x 12 inch and can take up to 24 frames. It is possible to have two colonies in the brood box as there is an entrance at either end. It has half-size honey supers, which take 6 frames that are lighter than full supers and are correspondingly easier to lift. The Dartington was originally developed by Robin Dartington so that he could keep bees on his London rooftop. Beehaus: A proprietary design for a beehive launched in 2009 based on the Dartington Long Deep. It is a hybrid between the top-bar hive and a Langstroth hive. The Long Box Hive is a single story hive utilizing fully enclosed frames (per the dimensions of Langstroth hives or deeper by variation,) but is worked horizontally in the manner of Kenya/Tanzanian Top-bar hives. This non-stacked style had higher popularity a century ago in the Southeast United States, but faded from use due to lack of portability. With the recent popularity of horizontal Top-bar hives, the Long Box Hive is gaining renewed but limited utilization. Alternative names "New Idea Hive", "Single Story Hive", "Poppleton Hive", or simply "Long Hive". So much has been written upon the habits and virtues of bees, that it is unnecessary to enlarge upon the subject [...]. Suffice it to say, that they imply industry, wealth, bounty, and wisdom in the bearer. In modern times, it is a key symbol in Freemasonry. In masonic lectures it represents industry and co-operation, and as a metaphor cautioning against intellectual laziness, warning that "he that will so demean himself as not to be endeavoring to add to the common stock of knowledge and understanding, may be deemed a drone in the hive of nature, a useless member of society, and unworthy of our protection as Masons." The beehive is also used with similar meaning by The Church of Jesus Christ of Latter-day Saints, or Mormons. From Mormon usage it has become one of the State symbols of Utah (See deseret). Beekeepers and companies may remove unwanted honey bee nests from structures to relocate them into an artificial hive. This process is called a "cut out". Black bears destroy hives in their quest for honey and protein rich larvae. Grizzly bears will also eat beehives and are harder to dissuade from taking several beehives. Hives erected by humans as a defense for their crops against elephants, are sometimes destroyed by elephants. These hives are hung on a single metal wire that encircles the crop field of some farms in African elephant territory. The installation is called a BeeHive Fence and was conceived by Lucy King. Humans have historically destroyed nests and hives of honey-producing bee species in order to obtain honey and other bee products. Humans may also determine that a beehive must be destroyed in the interest of public safety or in the interest of preventing the spread of bee diseases. The U.S. state of Florida destroyed the hives of Africanized honey bees in 1999. The state of Alaska has issued regulations governing the treatment of diseased beehives via burning followed by burial, fumigation using ethylene oxide or other approved gases, sterilization by treatment with lye, or by scorching. In New Zealand and the United Kingdom, the treatment of hives infected with the disease American foulbrood with antibiotics is prohibited, and beekeepers are required by law to destroy such colonies and hives with fire. ^ "Chapter 10 – Honey" (PDF). fs.fed.us. USDA. Retrieved 2 May 2018. ^ Seeley, T. D.; Morse, R. A. (December 1978). "Nest site selection by the honey bee, Apis mellifera". Insectes Sociaux. 25 (4): 323–37. doi:10.1007/BF02224297. ^ Seeley, T. D.; Morse, R. A. (December 1976). "The nest of the honey bee (Apis mellifera L.)". Insectes Sociaux. 23 (4): 495–512. doi:10.1007/BF02223477. ^ "Ancient Egypt: Bee-keeping". reshafim.org.il. Archived from the original on 2016-03-09. ^ Gilmour, Garth. "The land of milk and honey ... and bees!". Jamaica Gleaner. Archived from the original (Web article) on 28 March 2008. Retrieved 2008-03-18. ^ "Buckwheat honey from mud hoves". ^ Diana Sammataro; Alphonse Avitabile (15 June 1998). The beekeeper's handbook. Cornell University Press. p. 186. ISBN 978-0-8014-8503-9. Retrieved 17 August 2011. ^ The apiary by Alfred Neighbour - page 186 - Fittings and Apparatus, Ekes and Nadirs. ^ Crane, Ethel Eva (2013). The World History of Beekeeping and Honey Hunting. Routledge. p. 305. ^ Karpiński, Jan Jerzy (1948). Ślady dawnego bartnictwa puszczańskiego na terenie Białowieskiego Parku Narodowego. http://www.encyklopedia.puszcza-bialowieska.eu/ksiazki/bartnictwo.pdf: Instytut Badawczy Leśnictwa. ^ "La filière apicole en Lozère". lozere.fr. Archived from the original on 2014-05-04. ^ "" Les Ruches troncs et les abeilles noires" du Mont-Lozère sur TF1". lozere.fr. Archived from the original on 2014-05-04. ^ "La fôret des abeilles by Yves Elie" (PDF). nvbinfocentrum.nl. Archived from the original (PDF) on 4 March 2016. Retrieved 2 May 2018. ^ Thomas Wildman, A Treatise on the Management of Bees (London, 1768; 2nd ed. 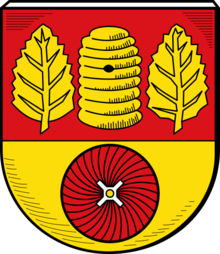 1770). ^ Wildman, op.cit., 2nd (1770) ed., at pp. 94-95. ^ Wildman, op.cit., 2nd (1770) ed., at pp. 112–15. ^ Stephen C. PRATT (2003). "Collective control of the timing and type of comb construction by honey bees (Apis mellifera)" (PDF). Arizona State University. Archived from the original (PDF) on 2012-03-15. Retrieved 2011-11-28. ^ "Miscellaneous Techniques in Beekeeping". University of Illinois at Urbana–Champaign. Archived from the original on 2011-10-20. Retrieved 2011-11-28. ^ Kooser, Amanda. "Sweet! Flow Hive collects honey at the turn of a tap". C|Net. Archived from the original on 12 June 2017. Retrieved 27 July 2017. ^ ""So much easier for the beekeeper and so much easier on the bees"". Flow. Flow. Archived from the original on 25 August 2017. Retrieved 27 July 2017. ^ Shawn Eyer, The Beehive and the Stock of Knowledge. Philalethes, The Journal of Masonic Research and Letters 63.1 (Winter 2010), 35–42. ^ Thomas Smith Webb, The Freemason's Monitor, or Illustrations of Masonry in Two Parts, 2nd ed. New York: Southwick & Crooker, 1802, 77–78. ^ Nibley, Hugh (1955). Lehi in the Desert, The World of the Jaredites. Salt Lake City, UT: Bookcraft. pp. 177–178. ^ "Beehives/Crops/Livestock" (PDF). Bear Facts for Homeowners. New Jersey Department of Environmental Protection. Archived (PDF) from the original on 2012-10-18. Retrieved 2009-07-22. ^ dfg.webmaster@alaska.gov. "ASK A WILDLIFE BIOLOGIST, Alaska Department of Fish and Game". www.adfg.alaska.gov. Archived from the original on 1 May 2018. Retrieved 2 May 2018. ^ "Elephants & Bees › Publications". Elephants & Bees. Archived from the original on 2014-08-08. ^ "Africanized Bee DeFense Against Hungry Elephants". Living the Scientific Life (Scientist, Interrupted). Archived from the original on 2015-10-02. ^ "Crawford Announces Destruction Of African Bee Hive". Florida Department of Agriculture and Consumer Services. May 5, 1999. Archived from the original on 2000-08-24. Retrieved 2009-07-22. ^ "Sec. 03.47.020. Importation of bees". State of Arkansas. Archived from the original on 2011-06-04. Retrieved 2009-07-22. ^ John, Williams (2010). Starting out with bees. National Bee-keeping Centre (Great Britain). Warwickshire, U.K.: Bee Craft. pp. 33–4. ISBN 9780900147098. OCLC 768486360. ^ "Beebase - Beekeeping information resource for Beekeepers". UK National Bee Unit. Control of Foulbrood. Archived from the original on 2017-10-12. Retrieved 2017-07-22. Look up beehive in Wiktionary, the free dictionary. Wikimedia Commons has media related to Beehives. Wikimedia Commons has media related to Bee skeps. This page was last edited on 15 April 2019, at 05:39 (UTC).